Description: During the Atlanta Campaign, Sherman maneuvered Johnston's Confederate army out of several successive defensive positions in Cobb County. This strategy spared the Union army from making costly frontal attacks on the well-situated Confederates. The Battle of Marietta was a series of military operations from June 9 through July 3, 1864, in Cobb County, Georgia, between Union and Confederate forces during the American Civil War. 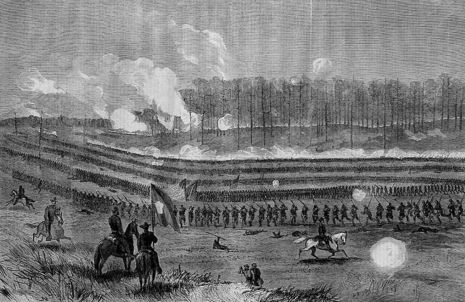 The Union forces, led by Maj. Gen. William Tecumseh Sherman, encountered the Confederate Army of Tennessee, led by Gen. Joseph E. Johnston, entrenched near Marietta, Georgia. Several engagements were fought during this four-week period, including the battles of Pine Mountain (June 14), Gilgal Church (June 15), Kolb's Farm (June 22), and Kennesaw Mountain (June 27). Sherman forced Johnston to withdraw partially on June 18 to protect his supply lines, but the Union forces were not fully victorious until July 3.